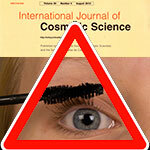 Home Articles News Scientific publications Mascara: expired, contaminated … but still in-service! This study investigated the habits of female students regarding make-up use, and quantifies the microbiological contamination of mascaras worn by this population. According to the results obtained, 97.9 % (43/44) of participants reported that they use or have previously used make-up after the expiration date, with mascara being the most frequently mentioned product. It was observed that on the sample collection date, 70.5% (31/44) of the students had some type of expired make-up. The microbiological analysis of 40 mascara samples revealed 2.54 ± 1.76 10â´ UFC mLâ»¹ bacteria and 2.55 ± 1.54 10â´ UFC mLâ»¹ fungi. Analysis revealed the presence of S. aureus in 79% of samples and of P. aeruginosa in 13%. The results are interesting because they show that women tend to continue to use make-up beyond the expiry date. Frequently, these products have a high level of contamination with pathogenic microorganisms. • This study is published in the International Journal of Cosmetic Science, Volume 35, Number 4, August 2013. • It is also available on the Wiley Online Library Internet website.